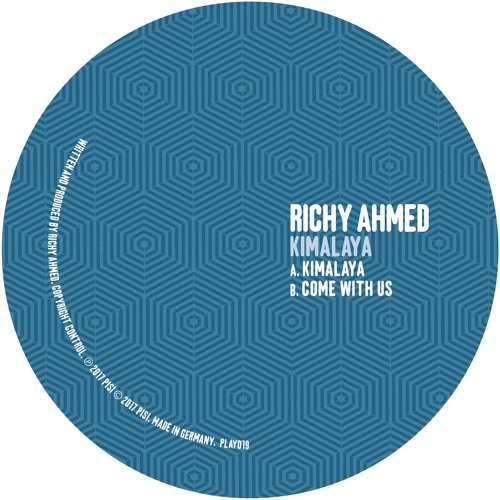 Key UK house player Richy Ahmed is next up on Play It Say It with a standout two track EP that proves just why he is such an essential talent. Ahmed is currently in the headlines for his Four Thirty Two label, which has put out some of his own great music and will A&R plenty from his peers in the future. It has also spawned a big party in Ibiza at Privilege, and has hosted events from Glasgow's Sub Club to Leeds' Mint Club. All this comes after years of Richy headlining all over the world and working with labels like Hot Creations and Crosstown Rebels. Now really into his stride as a producer, his latest is sure to rock 'floors worldwide. Up first is the big and bombastic 'Kimalaya' with its tribal tinged and jumbled beats and big woodblock hits. Wordless chants also join the groove, and the looseness of the whole thing is what will ensure it really gets the dancefloor going. Add in diving bass notes and some clever breakdowns and you have a sure-fire recipe for success. Just as infectious is 'Come With Us', a more nimble and peak time tune with lively synths darting and jumping about above techno leaning drums. It's a freaky cut with inventive synth patterns that really gets under your skin as it rumbles on. With these latest tracks Richy Ahmed once again offers up some truly fresh house perspectives.